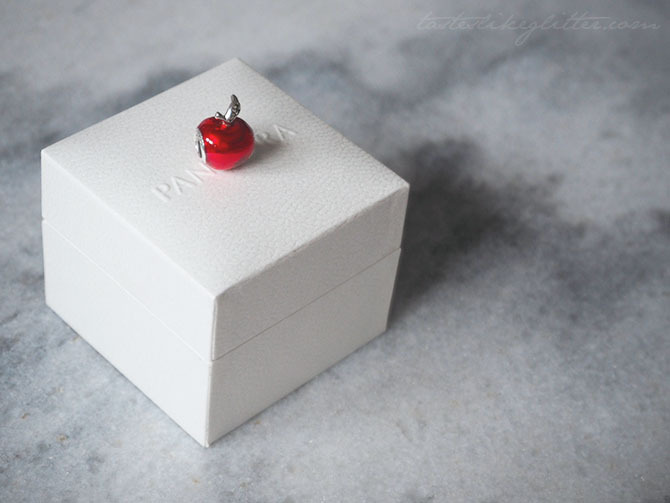 Pandora Snow White's Apple Charm. 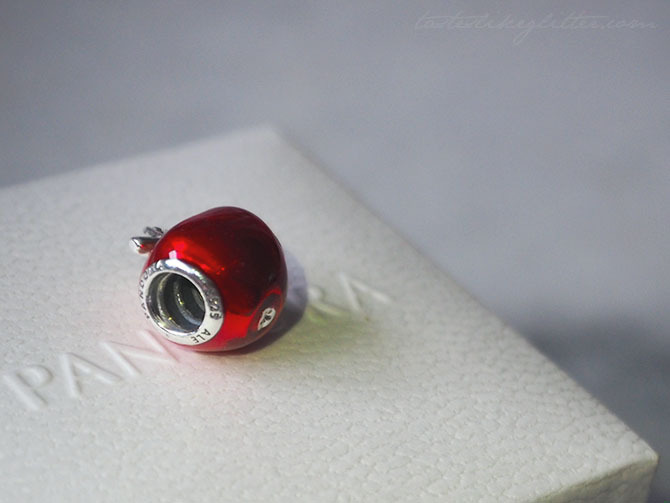 A few years ago, long before the Disney Pandora charms were available in the UK, I remembered seeing this fruity little charm and wishing I could get my hands on it. Not too much later they were slowly but surely starting to be released over here and it soon made its way into my wishlist. I was actually gifted this for my birthday from one of my besties, she had no idea this was top of my wishlist she just took a chance and it paid off. The pictures and online stock images do this charm very little justice. In person, the semi-translucent red enamel looks super and glossy. 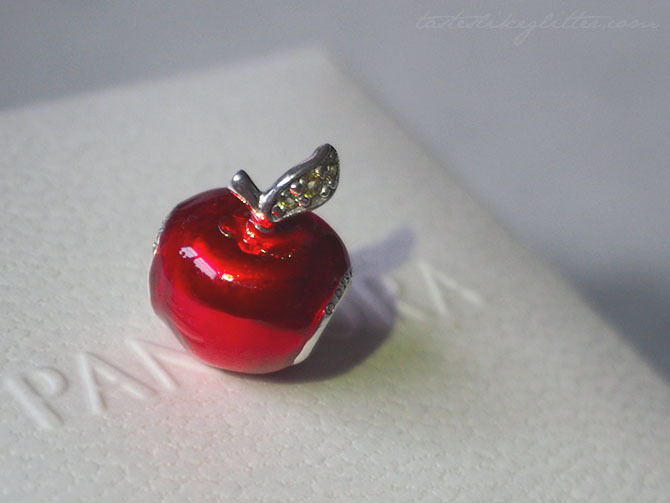 Super fitting for that famous poisoned apple. The stalk on the top is left plain but has a leaf attached which are adorned with three pale green cubic zirconias. Underneath the bottom of the core pokes through with a little silver just to finish off the overall look. The hallmarks are hidden away on either side so can't be seen at all once popped onto your bracelet. 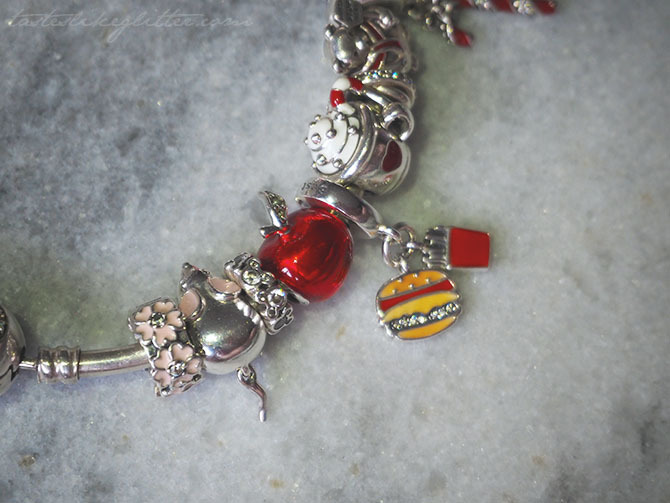 I absolutely love this, it's an eye-catching piece and I thought it fitted well nestled alongside some charms that also make use of red enamel. I can't say I'm one of those that has to have a perfectly planned out bracelet like some Pandora bloggers out there, I just like to put similar things together and that's about it. This has become a firm favourite and it's definitely a charm that stands out and makes a statement in the best possible way. The Chocolate Smiths Salted Caramel Brownie Bar. M.A.C Glitter - Pink Hearts.